Death from Above 1979 are the Toronto-based duo of Jesse F. Keeler on bass/synths and Sebastien Grainger on vocals/drums. Refusing to employ a lead guitarist, they played loud synth infused dance punk on the drum and bass combination alone. Originally named just "Death From Above", the duo changed their name after a legal dispute with New York City dance-punk label Death From Above (known as DFA Records since the September 11, 2001 attacks). "Death from above" was written on a helicopter in the movie Apocalypse Now, which was copyrighted in 1979. However, Grainger says this is simply a coincidence; 1979 was chosen as it was, amongst other reasons, "the year I was born." 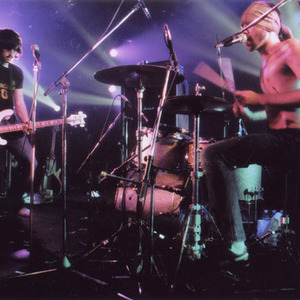 Death From Above 1979 had planned on recording the follow up to its debut full-length You're A Woman, I'm A Machine. There were plans to release it in three versions: the traditional bass/drums lineup, a full-band lineup with musicians assembled by Grainger, and a remix album. The albums featuring a full band and remixes were supposedly to be released on the band's official website. In 2005 the video for "Romantic Rights" won a VideoFACT award at the MuchMusic Video Music Awards. On August 4, 2006, the band announced they had decided to split "almost a year ago" due to the strained relationship between the two - claiming they only talked during interviews and just before shows - not to mention the fact that they had achieved all their aims after the record went gold in their native Canada. Keeler was slated to play bass on the Queens of the Stone Age album Era Vulgaris, but later revealed on the Death From Above 1979 message board that he could not due to scheduling conflicts. Keeler is now one half of Mstrkrft, his new project with producer Al-P. In 2011 it was announced that the band were reuniting to perform at Coachella, then the band announced that they were planning to reunite on an ongoing basis.